Here’s an ad from a Playbill for an Olsen and Johnson play performed in 1939 during the World’s Fair. 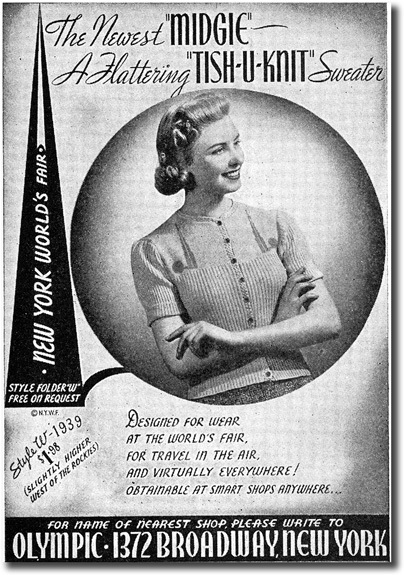 This particular ad features a fashionable “Tish-U-Knit” sweater, obtainable at “smart shops anywhere”! My favorite part is where you have to send them a letter to get the location of the nearest shop that sells the Midgies. Thank goodness we live in the FUTURE! Hit the link for more great ads.